International Religious Freedom Advocacy: A Guide to Organizations, Law, and NGOs is a unique guidebook for engagement, providing helpful insights into the tangled web of international organizations, international law, and non-governmental organizations that work to advance religious freedom worldwide. This handbook focuses on the practical; it is neither an exhaustive encyclopedia nor an academic treatise debating the "theology" of religious freedom. It is a user-friendly, straightforward tool for empowering would-be advocates to effectively promote religious freedom. 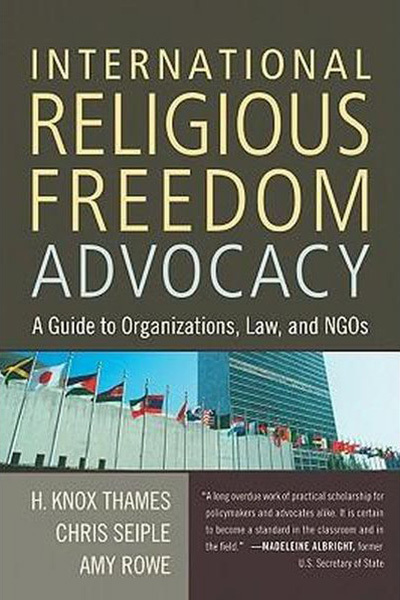 "This Handbook outlines practical and clear strategies for advocates of religious freedom. As Pope Benedict XVI reminded us on his visit to the United States: 'The task of upholding religious freedom is never completed.' This Handbook will help advocates to uphold religious freedom and by so doing promote justice and peace in the world." "Drawing on a wealth of first-hand experience, Chris Seiple, Knox Thames, and Amy Rowe have produced a serious, systematic guide to the complex world of international religious freedom advocacy. From the UN to the EU to the African Union, International Religious Freedom Advocacy offers individual religious freedom advocates a unique 'how-to' manual to the daunting task of navigating multinational organizations and global NGOs. This book is an important contribution to the field." "An indispensable resource for anyone interested in international religious freedom: scholars, activists, journalists, policymakers, and concerned citizens." "This book gives the essential documents and information to defend religious freedom effectively. My colleagues around the world must get this book." "When it comes to explaining the intricate web of international laws designed to safeguard religious freedom, and the myriad institutions that play a role in implementing those laws, there is no better book than this. This top-rate work of scholarship is a must-read for any practitioner or student engaged in or studying the protection of religious freedom." "A signal contribution to the international human rights movement. With precision and confidence they explain the intricacies of international mechanisms for securing relief from religious persecution and make them available to human rights advocates everywhere. May we hope that this essential guidebook will be translated into many languages." A long overdue work of practical scholarship for policymakers and advocates alike. It is certain to become a standard in the classroom and in the field.